Toyota Etios Liva prices start at Rs. 5.58 lakh for petrol and goes upto Rs. 6.63 lakh. The prices of Etios Liva diesel variants start at Rs. 6.86 lakh and the top-end diesel is priced at Rs. 7.78 lakh. Toyota Etios Liva is available in 12 variants and 2 colours. Share your experiences with Etios Liva? The claimed ARAI mileage for the Toyota Etios Liva petrol is 18 kmpl, and for the Toyota Etios Liva diesel is 23 kmpl. A genuinely spacious 5-seat hatchback, the Etios Liva offers a lot of storage space - a 13-litre cooled glovebox and 251 litres of bootspace! The engine and transmission are tuned for city driving while the electrically adjustable ORVMs, powerful A/C, steering-mounted multimedia controls and good all round visibility enhance comfort. The ride is comfortable while the handling is neutral. It is backed up by Toyota dependable quality, service network and affordable parts. Looks rather bland from the side while the interior quality feels sub par. There’s not even touchscreen infotainment system on offer. Other cost-cutting measures prevent it from feeling premium. For example, the A/C controls are old-school, dial-type units with flimsy build. The front seatbelts are not height adjustable and can prove to be cumbersome for shorter drivers. Also, there’s no dead pedal or space to place your left foot on longer drives. The Toyota Etios Liva makes sense for those who prefer space and practicality over everything else. The 1.5-litre petrol is smooth and the 1.4-litre diesel is dependable. The Etios is let down by cost cutting measures and a bland design. Q. Which varient is good of Liva diesel? Q. Etios or Baleno which is better? Baleno, in terms of looks and space. Plus Maruti assurance. Q. Which version better Diesel or Petrol? Q. Which is better, Toyoto Etios Liva Limited edition, Swift VXI(AGS) and Tiago XZA? Toyota Etios Liva limited edition, i also have maruti swift zdi, TATA zest I don’t like performance of both car. TOYOTA AT ITS BEST, TOYOTA BELIEVES IN AFTER SALES SERVICE. Q. How do you feel driving in Etios Liva, how is the durability after 5 years and share your experience about long trips? The Toyota Etios Liva has been given a facelift along with its larger sibling, the Platinum Etios, to help it look more premium in the face of increased competition. Toyota has even added eye-catching, dual-tone colours to make the Etios Liva look a tad sporty. Like the Platinum Etios, the Etios Liva has the advantage of offering more space on the inside than any of its hatchback rivals, a whole lot of safety features as standard, proven underpinnings and the backing of a reliable and affordable service network. Updates include a new bumper and grille that give the Etios Liva a hint of sportiness. Toyota has used the same formula for both the Liva and the Platinum Etios, adding a bloder face which includes a new bumper with fax intakes. The changes seem to be minimal in nature when viewed from the side. That said, the dual tone paint option is a welcome addition. Like the Platinum Etios, the Liva has the same well built feeling about it. It has enough space to seat five people properly, but misses out on a rear centre armrest. The sense of space inside is enhanced thanks to extra large windows and a beige theme. The updated instrument cluster and electrically foldable mirrors along with standard safety features are the only additions to the Liva. It misses out on an automatic climate control and a touchscreen infotainment system like many of its competition. The Toyota Etios Liva can be had with two engines - a petrol and a diesel - both paired to a 5-speed manual gearbox. The 1.5-litre, 4-cylinder petrol develops 90PS of maximum power and 132Nm of peak torque. The 1.4-litre, turbocharged 4-cylinder diesel engine develops 68PS of power and 170Nm of torque. Four variant levels are offered with each engine - G, GX, V and VX - with prices ranging from Rs 5.25 lakh to Rs 6.21 lakh for the petrol and from Rs 6.54 lakh to Rs 7.36 lakh for the diesel variants. Maruti Suzuki Swift: The all-new Swift starts from where the old model left off - at the top. The chassis is lighter, there is more space on the inside, the design is evolutionary on the outside but revolutionary on the inside and there are new features which make it even more premium. Hyundai Grand i10: The Hyundai Grand i10 has been given a facelift to keep it in contention in this fast moving segment. Though it is on par with the competition in terms of quality, features and a good diesel engine, it loses out on interior space. Fiat Punto Evo: One of the oldest cars in the segment, even the facelift is an old car - launched back in 2014 - the Punto Evo lives on a legacy of build quality and handling prowess with surprisingly low interior space and old features. Renault Pulse: One of the other old cars in the segment, the Pulse is Renault’s version of the Nissan Micra. While it does have space and an efficient diesel engine, the car’s age is showing in the sea of new age competition. While the Toyota Etios Liva scores high in terms of interior space, affordability and dependability, its built-to-a-cost quality and please-all but bland design let it down in a segment filled with more excitable products. 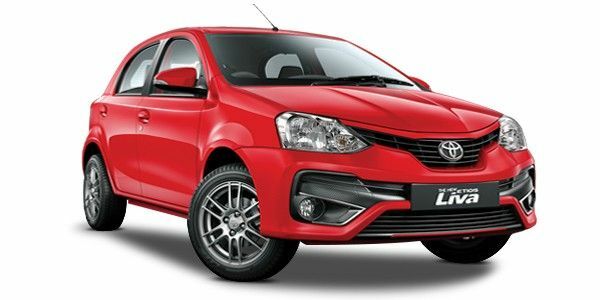 Confused about Toyota Etios Liva?